EMT stands for "Extraordinary Masochistic Tendencies (joke At Expense Of Emergency Medical Technicians)"
How to abbreviate "Extraordinary Masochistic Tendencies (joke At Expense Of Emergency Medical Technicians)"? What is the meaning of EMT abbreviation? 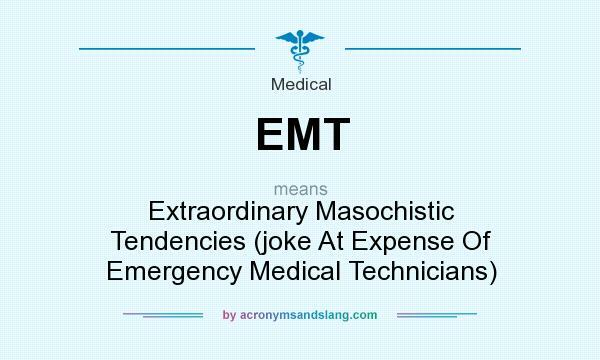 The meaning of EMT abbreviation is "Extraordinary Masochistic Tendencies (joke At Expense Of Emergency Medical Technicians)"
EMT as abbreviation means "Extraordinary Masochistic Tendencies (joke At Expense Of Emergency Medical Technicians)"